Last week, Facebook launched its new camera-focused update that brought along "Facebook Stories" into the main iOS application. Like Snapchat and Instagram Stories before it, Facebook Stories let users post a picture or video onto their feed, which disappears 24 hours later. 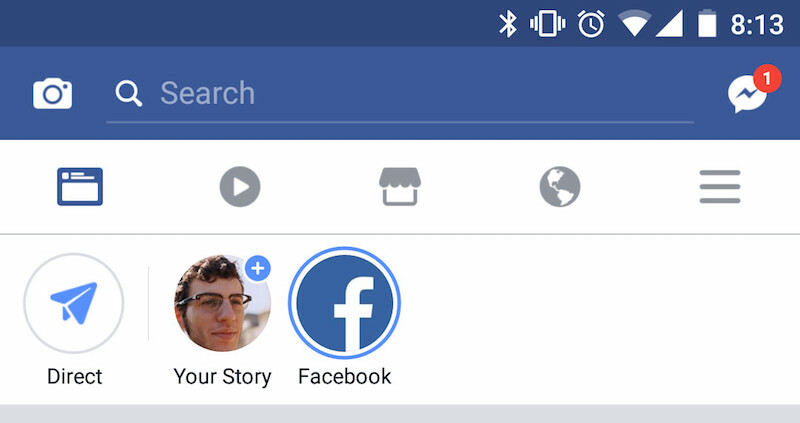 Unfortunately, adoption of Facebook Stories appears to have been fairly low and users have begun to notice that the social network company is making a slight UI tweak to the feature in an attempt to boost usage (via The Verge). 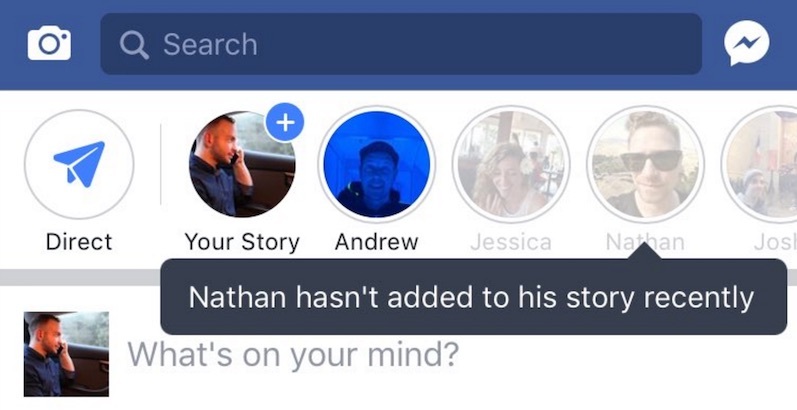 When it launched, Stories showed a circle with "Your Story," a Facebook bubble that explained how to use the new feature, and then listed your friends' Stories, if there were any to show. If there were none, the top of the Facebook app contained a lot of white space (as seen in the image above). Now, the company has begun to fill out this white space in the event that none of your friends are posting to Facebook Stories with ghost-like, grayed-out profile pictures. When tapped on, the bubbles simply remark that "[Blank] hasn't added to their Story recently." Adding to your own Story remains the same, with a tap on your own profile bubble. Although the update could be a simple UI clean-up to address the white space issue when not many Stories were up on the app, users online are looking at it as Facebook's attempt to draw their eyes to the new section of the app with pictures of their friends, convincing more people to post a Story of their own. On Instagram Stories, friends' Stories are grayed out only after you've tapped through their most recent posts. If no one has posted anything, the space remains empty. Since Instagram Stories and Facebook's energetic push into video content, Facebook and Snapchat have remained rivals in the mobile app space. On April Fools' Day this past weekend, Snapchat finally responded to Facebook's recent glut of "Stories" updates with a copy of its own that allowed users to snap a picture using a filter that looked just like a post on Instagram. Saw this this morning. It made me hate Facebook just a little bit more. When will these social media apps realise that nobody wants a crappy version of Snapchat. If they want Snapchat they will use Snapchat. Serious question, Facebook is ripping off everyone without paying any price or any legal or social repercussions. Do these companies or their users simply not care that Facebook is copying everything and hocking it as their own? If only they would realize that this feature is neither needed nor wanted. More convoluted, less user friendly and relying on multiple apps. And killing off messages in mobile browsers in a move trying to force you into using their POS apps. I know they are doing well, but why is a mystery to me. Every day. I use loads of things I hate simply because there aren't any other viable options. Everyone I want to keep tabs on is using Facebook, and they don't show any signs of moving elsewhere. That's why I use it. The tool does an okay job of letting me keep tabs on people, but seems intent on becoming the most bloated and difficult to use service out there. It was better when stuff like this took the form of Facebook "apps" that I could choose to ignore, but that's changed and there's no way to opt out of all the new stuff Facebook keeps piling on. Legit question, do you use Facebook? If you hate it, why not delete your account? As others are telling their stories (on a forum, not using Facebook! :D) - I created a Facebook account in 2007 as others were encouraging me and almost instantly had a load of people from school who were bullies and the like wanting to be friends. If that wasn't enough of a turn off, I found the whole thing a gibbering mess and just full of random thoughts that I had to filter through in order to find something of interest. It's almost like a stream of people's consciousness. After two months I stopped using it, that's 10 years ago and I'm still Facepalm free. I ditched WhatsApp as soon as that data leach bought it out and now use telegram.